Sometimes I wait and wait to put something on the blog until I’ve had a chance to cook a dish I think I could serve at a restaurant, like late summer sweet corn risotto with blistered tomatoes and arugula pesto. And to be honest, lately those kinds of meals are few and far between. Most often, I end up throwing together an assortment of vegetables with hummus sauce and calling it a power bowl (incidentally, I am also in the heat of a steamy love affair with our rice cooker). I tend to feel like those aren’t the meals I can share here, that I should wait to post something jaw-dropping. 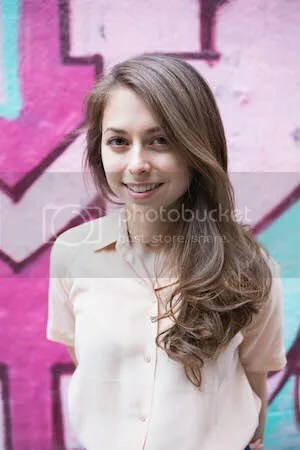 But I was talking to a friend the other day who told me that she finds herself skimming over recipes with beautiful photos and thinking…that’s great, but it’s going to take me 2 hours to make that, and it might not even work out! It turns out that people want basic, doable, weeknight meals that taste better than Chipotle and won’t use every dish in the house. So I’m embracing simple recipes. 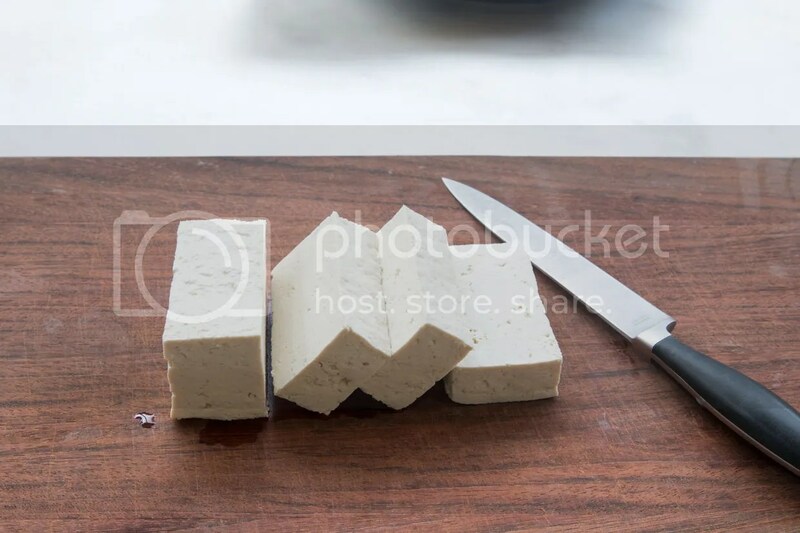 Tofu is one of those things that vegans try not to talk about—at least *I* try not to bring it up when I’m insisting to someone how delicious and non-boring vegan food can be. As I’m sure you know, when tofu is cooked badly, it’s a spongy mess, and people tend to associate that soggy, flavorless mass with ALL vegan food. 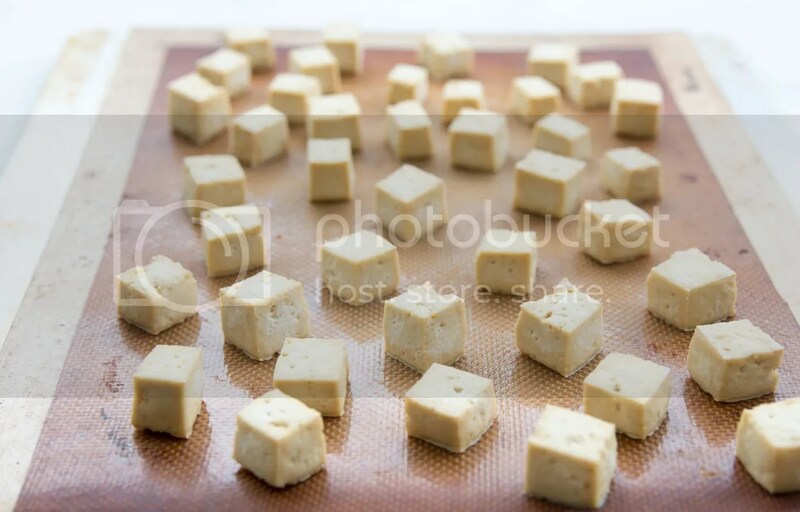 But if you learn to cook tofu in a way you enjoy, it is a real staple in vegan cooking. It can do all kinds of things, like masquerade as scrambled eggs or show up looking like fettuccine alfredo. And besides, it’s just soybeans! So there’s nothing to be afraid of. And it turns out that the easiest way to cook it and keep it on hand for the week is a super simple method that my good friend and former roommate told me about last year (thanks, Ker). Literally ALL you do is (1) drain the tofu, (2) slice it, and (3) bake it, and it comes out of the oven all golden brown and crispy, with nutty undertones. Alright, I just wanted to say “nutty undertones,” but good quality tofu* actually does have its own toasty flavor. And the best part is that this baked tofu is verrryyy similar in texture to deep fried tofu, but without all the oil or the hassle of frying. You can serve the tofu over rice, stir it into pasta, mix it into curries or stir fries, or even put it on top of some ramen from a packet. I like to keep some on hand in the fridge so I can bulk up meals throughout the week. 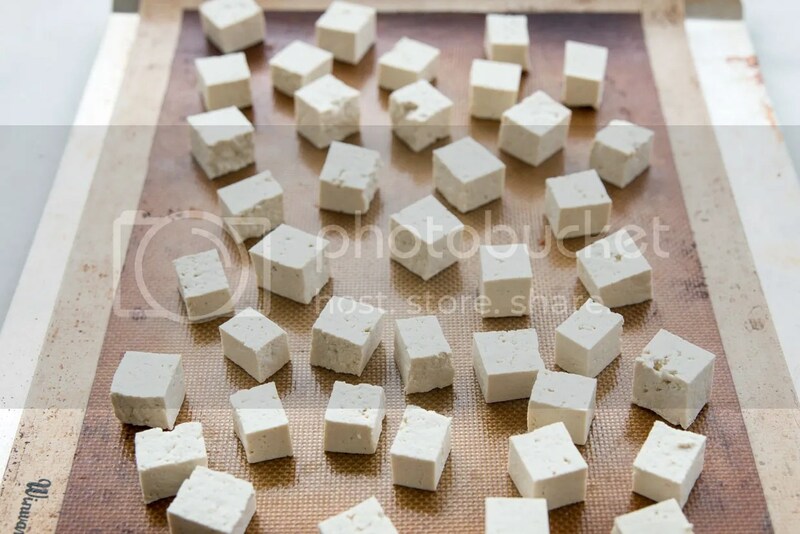 People say that tofu is there to absorb the flavor of whatever you put it in, but ever since I’ve started making tofu like this I’ve learned to appreciate it on its own. In fact, it takes a lot of willpower not to pop all of these into my mouth right off the baking sheet. Drain the tofu and slice into 1-inch slabs. Layer paper towels or tea towels on a plate or baking sheet and top with more towels. Top with something heavy, like a cast-iron skillet or a pot with a bunch of books in it. 😉 Drain for 20 minutes. 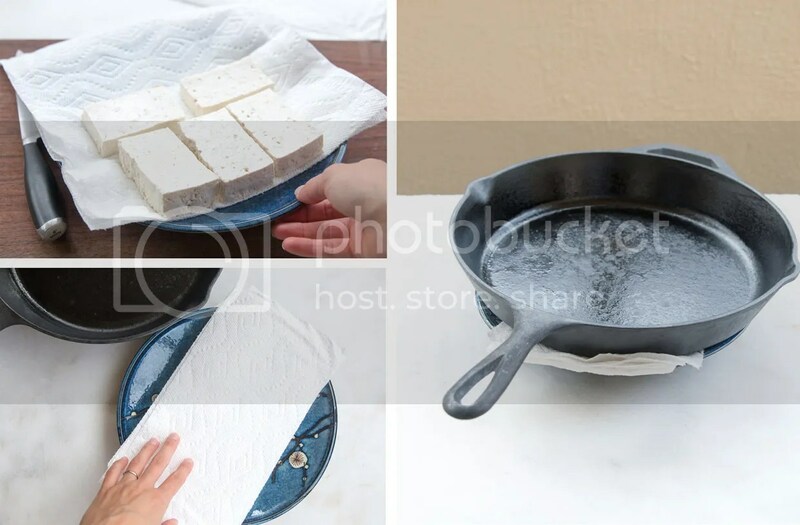 While the tofu is draining, preheat the oven to 375º F. Line a baking sheet with a silicone baking mat (mine is called a silpat) or parchment paper. 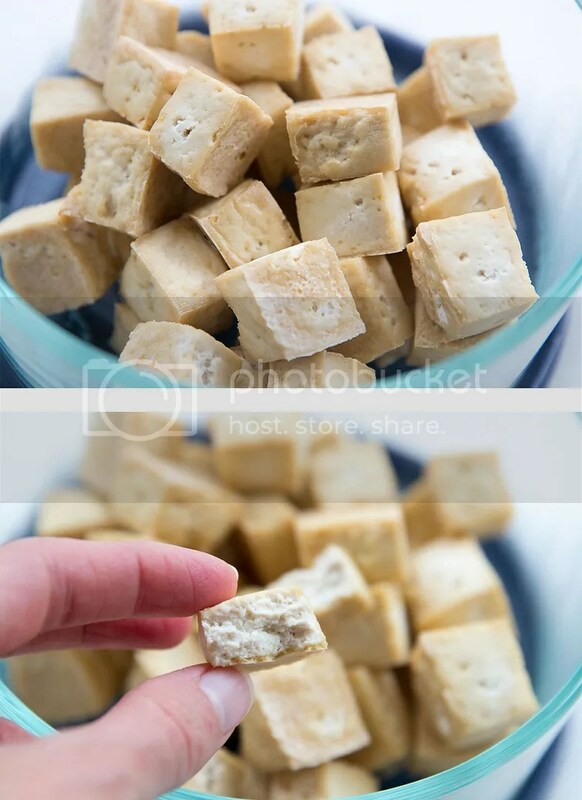 Slice the drained tofu into ¾-inch cubes. Scatter them across the baking sheet and bake for 20–25 minutes, or until they are golden brown and beginning to puff up like pillows, and the tofu lifts off the silpat or parchment without sticking. Serve immediately on top of rice bowls, tossed into ramen, stirred into curry, or just dipped in sauce. 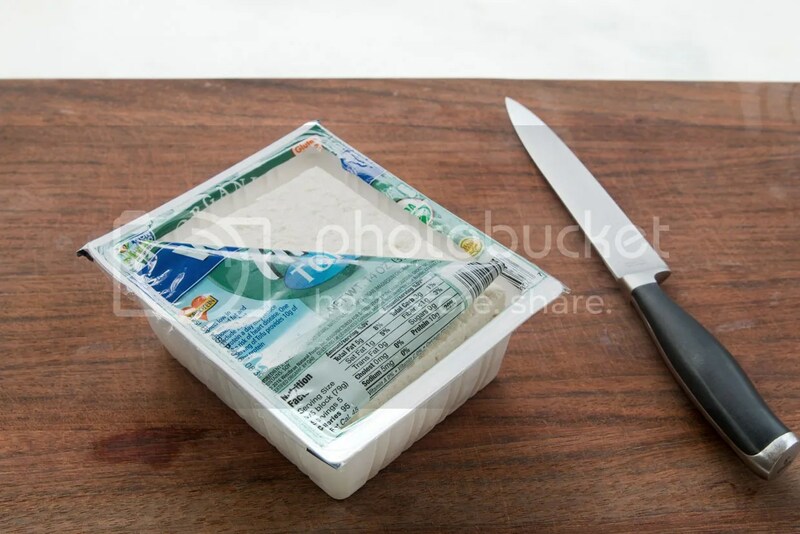 Keeps in the refrigerator for 2–4 days. To reheat, warm in a skillet or microwave, being carefull not to overcook—it will get gummy and tough.